Since this website is all about books and writing and life as an author, I figured I’d sneak in the occasional review of other authors’ books too. The author is Michael Pollan, and the book he spoke about is Cooked: A Natural History of Transformation . Parnassus Books, an independent bookstore right here in Nashville (which, incidentally, is owned by Ann Patchett who I greatly admire), had organized a reading/signing event, which I might have missed, were it not for a good friend of mine who is more diligent than I am and bought tickets for a group of us to attend. That’s how we all filed into Blair Auditorium at Vanderbilt University one rainy evening last week, eager to be enlightened by this celebrated authority on all things food. The first thing Michael told us: He had a lot of fun writing Cooked. I always love hearing that, though I suppose it’s true for most authors. It makes you want to go back home and start writing immediately, it sounds so exciting. Especially the way he described his typical workday while writing that particular book (for a glimpse into my typical workday as a writer, click here). He’d type for an hour or so, then go downstairs to stir his sourdough starter, then type some more, then go knead the dough for a bit, then type some more while it rested, then put the bread in the oven and finish chapter 13 while it baked. Or something like that. I was sitting there imagining the wonderful aromas wafting through his house and resolved to start baking some bread of my own ASAP. He also told us that Cooked was a bit of an afterthought. After 15 years of writing about the food chain, visiting big monoculture farms on one end of the spectrum and learning about nutrition on the other end, he eventually realized that the process of cooking was implicated in both. That by outsourcing the preparation of our food to big corporations who have an interest in buying ingredients cheaply, we are complicit in the fact that it might not be so good for us. The best predictor of a healthy diet, he maintains, is whether our food is cooked by a human or a corporation (hint: go with the human), not necessarily the actual nutrients. There were some amusing side notes. Like, other primates our size spend half their life chewing. We would not get much done if we spent half of our life chewing. Raw foodists take note. (This last one is quoted verbatim.) Another one came straight from one of the book’s passages he read, where he elaborated in detail what kind of a strategy the onion employs “from its point of view” to produce tears in those who try to cut it. Personally, I was thrilled to hear Mark Bittman mentioned twice. I think of Mark Bittman at least once a week when I use his heavyweight of a cookbook, How to Cook Everything, to cook, well, everything that I cook. He is the only cookbook author that manages to be entertaining while doling out a recipe, throwing tidbits of the “why” and “how” out there that make you feel as if you’re not simply following instructions. He also appears in my favorite newspaper, the New York Times, every once in a while. 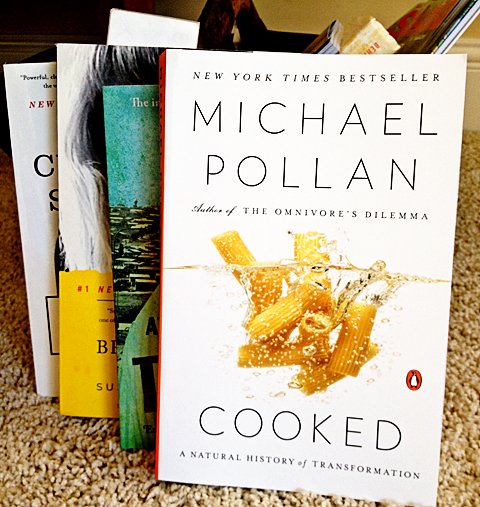 I was glad to know that Michael Pollan seems to think highly of Mark Bittman. Cooked covers cooking with each of the four classical elements employed to transform our food so that we don’t have to chew it for so long: fire, water, air, and earth. The first two are self-explanatory, and the last two have to do with all things fermentation. He describes how he apprenticed himself to different chefs who were authorities in their respective fields, ranging from a North Carolina whole-hog-roasting pitmaster to the owner of a world-class San Francisco bakery. His experiences, he told us, were transformative. Not only does cooking transform our food, it also transforms us. And, perhaps most importantly, it transforms our social life. Which is why we should all do it more often. If Michael Pollan ever turns up in your vicinity to speak, go check him out. In the meantime, you might want to pass the time you’re not cooking by reading Cooked. Next Book Publishing Milestone: Paperback Out the Door!